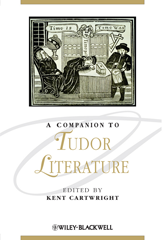 A Companion to Tudor Literature presents a collection of newly commissioned essays focusing on English literature and culture from the reign of Henry VII in 1485 to the death of Elizabeth I in 1603. Presents students with a valuable historical and cultural context to the period. Discusses key texts and representative subjects, and explores issues including international influences, religious change, travel and New World discoveries, women's writing, technological innovations, medievalism, print culture, and developments in music and in modes of seeing and reading.